Unsere einsamen Hütte sich ständig, die weg für eine Weile verstecken will? Abseits der Alpenroute führt Sie eine unbefestigte Straße über den Fluss und durch den Wald zu einem Ort, den Sie nie wieder verlassen wollen. Wanderwege verlaufen direkt vor der Tür und Sie sind umgeben von unberührter Natur. Der North Fork Stream verläuft das ganze Jahr über direkt unterhalb des Anwesens und kann von Deck, Schlafzimmer und Speisesaal aus genossen werden oder einen kurzen abenteuerlichen Pfad entlanggehen, um Ihre Linie zu werfen und Ihre Füße zu tränken. Eine perfekte Kombination aus rustikalem und elegantem Charme, entworfen mit rauen Hölzern und natürlichen Elementen. Diese Kabine bietet einzigartige, schicke Details für den ultimativen Aufenthalt in den Bergen. Outdoor-Enthusiasten werden von den vielen Möglichkeiten vor der Haustür begeistert sein: Wandern, Langlaufen, Schneeschuhwandern, Reiten, Mountainbiken und Angeln, um nur einige zu nennen. Für diejenigen, die eine entspannende Art von Seelentherapie suchen, bietet Conifer Creek alles, was man sich wünschen kann - unter den Sternen zu sitzen, hypnotisiert von den Flammen eines Lagerfeuers, sich auf dem Deck zu entspannen, die Geräusche und Sehenswürdigkeiten der Natur zu erleben - das Rauschen der Bäume, das Rauschen des Baches. Es ist bekannt, dass Kolibris, verspielte Eichhörnchen, wilde Truthähne, Elche, Hirsche und Elche hierher kommen. Wenn es draußen kühl wird, genießen Sie die Wärme der innen liegenden Steinkamine. (Oder schauen Sie fern oder surfen Sie im Internet, wenn Sie müssen.) Dies sind nur einige wenige Optionen, die der Besucher genießt. Conifer Creek ist ein perfekter, abgeschiedener Ort für Hochzeiten, Yoga-Retreats, geschäftliche und familiäre Versammlungen, therapeutische Ruhe und ein Rückzugsort für Schriftsteller, Künstler oder alle, die einen ruhigen und friedlichen Zufluchtsort suchen. Lassen Sie Stewart Mountain Lodging Ihren Urlaub in den Bergen aufnehmen! Wir leben hier in Sundance Vollzeit - also sind wir immer erreichbar. Sie werden unseren privaten Park "The Hollow" mit Außenkamin und Zip Line Swing lieben. Mit unserem umfassenden Concierge-Service können wir mit unseren Lieblingsführern einen Tag zum Fliegenfischen arrangieren, verschiedene Tagesausflüge und / oder Wanderungen in der Umgebung empfehlen oder eine Massage bei Ihnen zu Hause arrangieren. Sie lieben die persönliche Note und die herzliche Gastfreundschaft Ihrer Bergwirte. Wir würden diesen magischen Ort gerne mit Ihnen teilen. Loved every minute (we stayed over a month!) at this house. Fantastic location, secluded, a stream rushing by, hummingbirds, hot tub, cabin-like house perfectly outfitted ... so wonderful, we really hated to leave this slice of heaven. Hiking trails right off the property. Stewart Mountain Lodging makes it so easy and welcoming. From what they do with the welcome basket, tickets to special events, and everything in-between to picking up the trash every week ... all the people were great ... no need was not answered and taken care of. These "Stewart Mountain" people know the value of customer service. Great place to stay, would highly recommend it ... and we would never come to Sundance area without checking in and staying with Stewart Mountain Lodging. Many accolades to hard work of Brad, Vickie and all her family. We miss you guys already! We really thought you would just move in full time and be our neighbors forever. Thank you for spending the month with us in such a magical setting. You were such gracious guests that transitioned to family immediately. We are so grateful to have met Maggie as well. We hope she enjoyed her stay in the mountains as much as you did. We hope the dog treats and mountain air were just what she needed. We hope we get all of you back again soon. Best wishes from all of us and thank you for the kind words! We had a terrific time at the cabin at Conifer Creek. We were looking for a cabin in the woods to relax and unwind after several days of hiking in the National Parks of Utah. The cabin has a beautiful stream flowing below and amazing scenery, it's just what we were hoping for. We all had our own space and yet were together. The hot tub was a huge hit with the family and soft comfy robes were provided as well...it was nice to visit a home that felt like home. We loved the decorations and the beds were super comfy. We also visited the Sundance area not far from the cabin and enjoyed a wonderful dinner at the grill and we ziplined one day...whew what an awesome experience. Thank you again for providing everything at the cabin to cook with and a few extras. Thank you for sharing your experience Alicia. We love the location of Conifer Creek as much as you do and hope to get you back again. We've done our best to make our cabins feel as much like a home for our guests as possible. Happy to hear you got plenty of adventure in with some of the surrounding amenities and activities. Come back and play again soon. Just what we ordered. Sunshine and seclusion. The cabin and property were perfect and suited our family gathering of 8 to a tee. The dining area is fabulous for family feasts and the downstairs play area ideal for youngsters and we were so grateful to have our sweet Suie dog with us. We got our money's worth in the hottub and we were well supplied with pretty much anything we needed. Homeowners even delivered a cake for my mother's 70th! Four wheel drive is a must this time of year. Conifer creek is a beautiful destination and we could not have asked for more. Thank you! Thank you Christa for the review! We loved hosting your stay. Our favorite guests are families coming to celebrate special occasions. The memories made last forever. I too love the location of this cabin. It truly is tucked away in the forest. I'm guessing Suie loved the trails just outside your front porch. Now, what can you come to celebrate next, maybe this summer? You would love the hiking trail just outside your door that leads you to Stewart Falls. It's one of my favorites. Every season is spectacular at Conifer Creek, but summer with the sound of the stream is so relaxing. Come see for yourself! You were great guests and we would love to have you back. 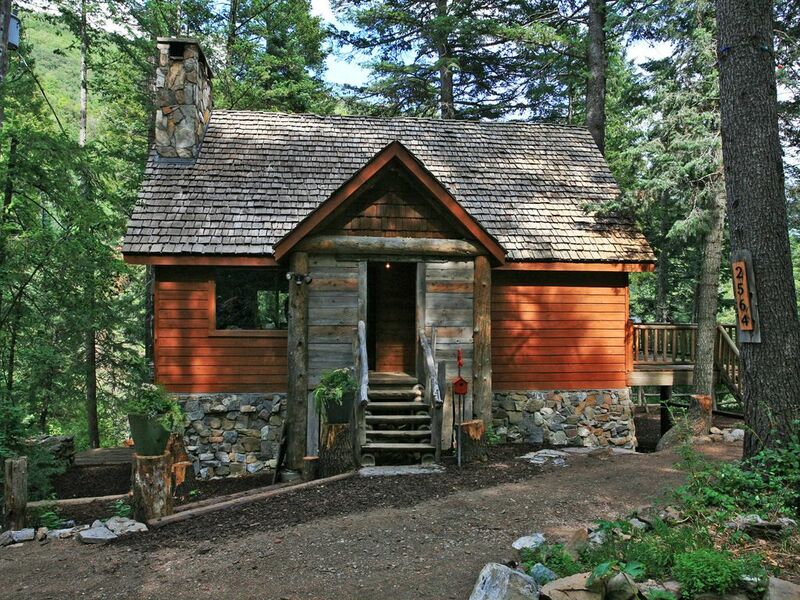 And if next time not all can make it, we will find you one of our smaller cabins to cuddle up in. Wish I Could Wake up Here Every Morning! My husband and I took our ten-year-old child up to Sundance for a quick getaway and couldn't have been happier with the cabin we chose. I was a bit apprehensive to book at first because I thought it may be too far removed and inaccessible. It was not; we had no trouble getting to the cabin on the well-maintained, short dirt road. We were able to do the full moon lift ride at the resort as the cabin is very close to all the resort amenities. As for the cabin itself, it was perfect. The master bedroom is a great sanctuary-tucked away in the basement with an amazing view of the stream. I wish I could wake up to that view every morning! The kitchen was well stocked and had all the essentials we needed to make breakfast and dinner. The basement had a great area to relax, watch a movie or play a game with kids. In all, I will be back for many more weekends in this home. I can't wait for the winter so I can enjoy the views of the snow. The cabin was very clean, comfortable and private. This is a great couples retreat as well as a family get away. All the comforts of home and nicely decorated. Secluded just enough to provide privacy. Old forest service roads provided some leisurely hiking trails and wildlife was abundant. We had a very relaxing stay and recommend this location for anyone looking to escape from the hustle and bustle of the city. Thanks for the review Christopher! Happy to hear you all fell in love with the cabin and the location on the stream. There is something magical about being on the stream and listening to the water run. It's even better in the summer so we hope we can get you back again soon. The cabin is very cozy with a little creek running below and two fire places. It's beautiful and I'm hoping to be able to go back to visit when I get my bridal pictures taken - it would be worth the trip. Everything we needed was provided and I wanted to take home the decor and the bed. The cabin is in a secluded area close to hiking, snowshoeing, Sundance ski resort and not far (15 minutes) from grocery stores, a mall and movie theater as well as anything else you might need. I highly recommend this property.